On An Overgrown Path: Now where did he put that Rumi CD? Now where did he put that Rumi CD? 'I thought I saw a Sufi cat' was more than an opportunist title for my recent post. Muslims are taught that cats should be cherished and loved and they often appear in Islamic folklore. The biographer of the Sufi poet Rumi tells how shortly before the poet's passing a cat came to him and meowed sadly. Rumi smiled and explained to his followers that the cat had told him: "Soon you will go to the heavens where you will find peace. But what will I do without you?" Rumi's cat did not eat or drink anything after the poet died and survived for only seven more days. The Sufi's followers buried the cat close to Rumi's tomb in Konya. In the photo above the resident Overgrown Path feline is searching for Ali Reza Ghorbani's musical tribute to Rumi. Read more about that CD in Songs of rebirth defy the mullahs. Photo is (c) On An Overgrown Path 2012. Advertising agencies, pet food manufacturers and others offering pots of money for Ginger to model for them can contact his master via the email address below. Report broken links, missing images and errors to - overgrownpath at hotmail dot co dot uk Also on Facebook and Twitter. 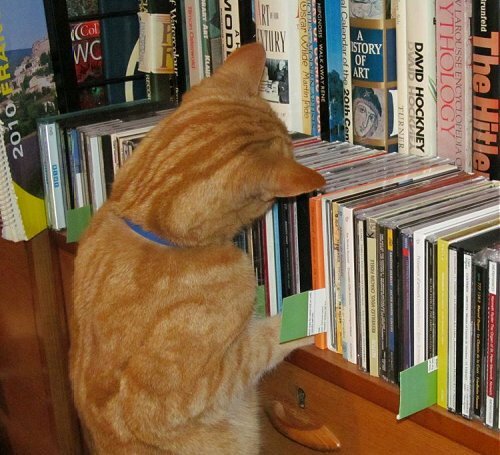 are you sure ginger isn't looking for a book instead? Cats, they're so unfaithful, you know!Or at least 8/10 are! Billoo, I have looked at the photo again and think you are right. I can now see that Ginger is reaching for a volume on David Hockney, presumably in search of Hockney's painting 'Mr and Mrs Clark and Percy' which features a white cat called Percy. (Actually the cat was called Blanche, but that is another story). And yes, cats are unfaithful. While I was typing that post Ginger jumped up on my newly cleaned car, walked across the bonnet and roof with muddy paws and ran off. I can't help but noticing that there's an orange CD in that image that looks suspiciously like a certain Ann Southam CD of mine. If so, I hope you enjoyed/enjoy/will enjoy it. If not, please pardon my ego-centric perspective. But a link to an Ann Southam CD never goes amiss. Good to know that there are other orange CDs floating about. Enjoying the writing, as always.